Welcome to the first Philosothon Project newsletter. You will see from what follows that there are varieties of ways in which Philosothon are being conducted. 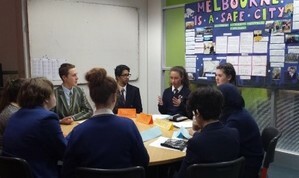 The Philosothon project is co-ordinated by the Federation of Australasian Philosophy in Schools Associations (FAPSA) and is the result of a generous grant provided by the Templeton Religion Trust in the US to give more Australasian students opportunities to participate in Philosothons. Over the next three years a variety of grant opportunities will be made available to schools to help them set up a Philosothon with local schools in their area. Other grants will be made available for academics, teachers and schools to enable them to be better equipped to participate in a Philosothon. The project prioritises the needs of remote schools and schools dealing with students from low socio-economic backgrounds but as you will see from the following there is already a great deal happening around the country with over 300 schools participating in Philosothons already. Why not organise a Philosothon for schools near you? There is no better time to do it. Simply fill in an application form and your school might be selected for a funding grant. Alternatively let us know that you intend to run one and we can assist you in the process. Over the next three years FAPSA will make available grants for schools and others to set up or participate in Philosothons. Studies have shown that students participating in a philosophical community of inquiry improve on a variety of academic and social measures. If you would like to make this available to your school community click one of the grant links or contact the Philosothon project office. 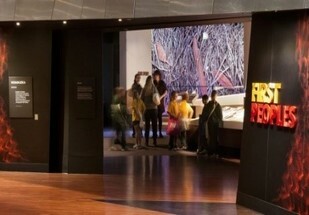 The 2017 Middle Years Philosothon was tailored to the context of the First Peoples Exhibition at the Melbourne Museum. Schools were invited to register 10 students, from Years 5 – 8 for this challenging, year-long commitment. Participating teams were expected to attend both events as detailed below. Throughout the school year these students are then encouraged to form Communities of Inquiry in response to their visit to the Museum. Each school will be responsible for supporting their Communities of Inquiry independently subsequent to the first event. Schools will then be invited to submit two philosophical questions to VAPS by November 1st, 2017. VAPS will choose the questions for the Philosothon and distribute these to schools in preparation for the final event. 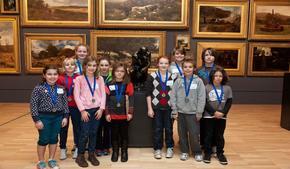 Junior School Philosothons are held annually at the Victorian National Art Gallery. See attached PowerPoint dealing about "Philosothons in Public Spaces. 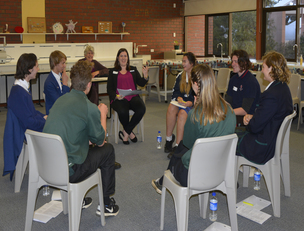 The 9th Victorian Secondary Schools Philosothon was held on Thursday 24th August 2017, 5:00-9:00pm at Ballarat Grammar City Cite. There were four rounds of twelve “Community of Inquiry” sessions. Each session ran for 30 minutes. All students participate in each round and each round is based on separate topics. Students remained in Year level groups for the first two sessions. Students are then placed in mixed groups for the final two sessions. Contact Dr Janette Poulton for m ore information. Grant applications for Travel Subsidies available here. WA has long been the home of Philosothons with the first Philosothon being held in Perth in 2007. Since then there are Philosothons being held in Perth, Bunbury and Albany. This year, Trinity College is hosting the Perth Philosothon on the 25th of October. The event has been well received and twenty-three schools have registered. These schools are from as far afield as Halls Head to the south of Perth, and Mindarie to the north, and represent both private and state schools. The stimulus materials, covering topics such as the morality of creating donor babies, the importance of privacy, the nature of the mind and the possibility that robots may become human, have elicited a wide range of philosophical questions generated by the students. If the questions are anything to go by, there will be plenty of stimulating discussions on the night. 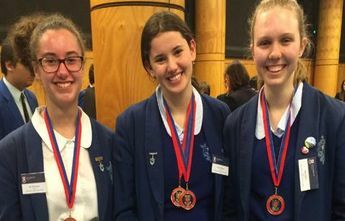 Since 2014, the South West Philosothon held at Bunbury Cathedral Grammar School has challenged the thinking of students from nine Western Australian regional schools, including those from state, independent and catholic educational sectors. This event adopts the format established at the Hale Philosothon with four communities of inquiry, two in year groups (8-11) and two in mixed age groups. 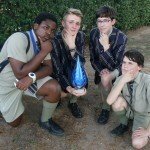 Our loyal and expert panel of philosopher judges and teacher facilitators decide which school receives the perpetual troph y hand-crafted from locally sourced jarrah, however, our most prized trophy is the laser engraved crystal “Most Promising Philosopher” trophy won by one student every year. We welcome the possibilities afforded by the Templeton Grant in encouraging more students from the regions to participate in the collaborative, critical and creative thinking event that is the Philosothon! We have trialled having Philosothons with our combined Year 11 and 12 classes and they have worked well. We are planning something for the coming years. The 2017 NSW (Sydney) Philosothon was held at St Andrew’s Cathedral School on 13 September. The evening of philosophical discussion was divided up into three Communities of Inquiry each focused on one of the following question: Is it moral to create a donor baby? Is the mind a physical thing? Is privacy important? Sixteen schools participated, with students from all around Sydney demonstrating their ability to think critically and collaboratively about these complex questions. Sydney Girls High School came first overall, followed by SCEGGS Darlinghurst and Meriden. The individual age group winners were: Vivian Zhu from Sydney Girls High School in Year 11; Alexandra Fraser from North Sydney Girls High School in Year 10; Freja Newman from Meriden in Year 9. It was fantastic to see so much enthusiasm for philosophical discussion from so many participating schools. 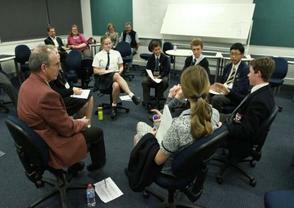 As plans are underway for next year’s competition, the NSW Philosophy in Schools Association is considering how best to use the Philosothon to nurture and develop that philosophical spirit among school students. The Queensland Philosothon is held in May of each year based in Brisbane. The senior Philosothon (Years 7-12) is hosted at the University of Queensland and the Junior Philosothon (Years 4-6) is hosted at Cavendish Road State High School. Students from a variety of state and private schools attend the Philosothons, with each awarding trophies for the winning schools and individual awards for the “Most Promising Philosopher”. The Philosothon complements school based work in philosophy, including the senior subject Philosophy and Reason and the Philosophy for Children program in primary schools, although many schools that do not offer philosophy perfom well in the competition. Students participating in the Philosothons inevitable impress both parents and students with their ability to ask insightful questions and analyse and synthesise sophisticated concepts. Grant applications for Teacher Professional Development available here. 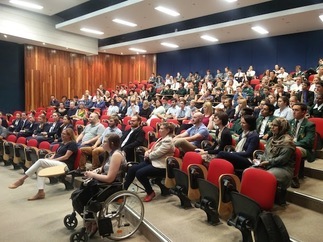 “Mix one hundred engaged, focused and extremely articulate students, some amazing teachers, top philosophy professors from all the Sydney Universities, a wonderful host school, challenging speakers and relevant interesting topics of discussion and what do you get? A wonderful few days at the 2017 Australasian Philosothon in Sydney which was held on the 25th -27th September at St Andrews Cathedral School. Some outstanding critical, collaborative and creative thinkers. The top schools from local Philosothons are invited to participate based on the results. Click here for the full report. Grant applications for training for Phd Students available here. The Philosophy Foundation held the UK’s first primary Philosothon. It took place in Deptford Green Secondary School and involved five primary schools (seven classes, 200 students in total) all part of a collaborative of state schools in Deptford, they included Deptford Park, Sir Francis Drake, Grinling Gibbons, Lucas Vale and St Joseph’s. Father Mark Smith and Julie Arliss from the Philosophy & Religion Department at King's have now spearheaded the Philosothon movement in the United Kingdom in collaboration with Dr Michael Lacewing from Heythrop College and Lizzy Lewis from SAPERE. The first Philosothon took place at King's College in January 2014.